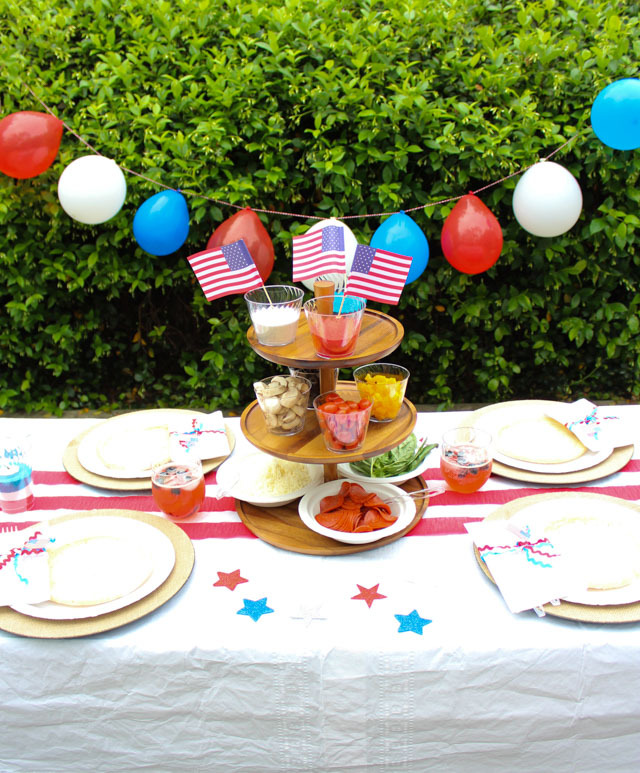 Host a 4th of July Party – 7 Simple Ideas to Try! 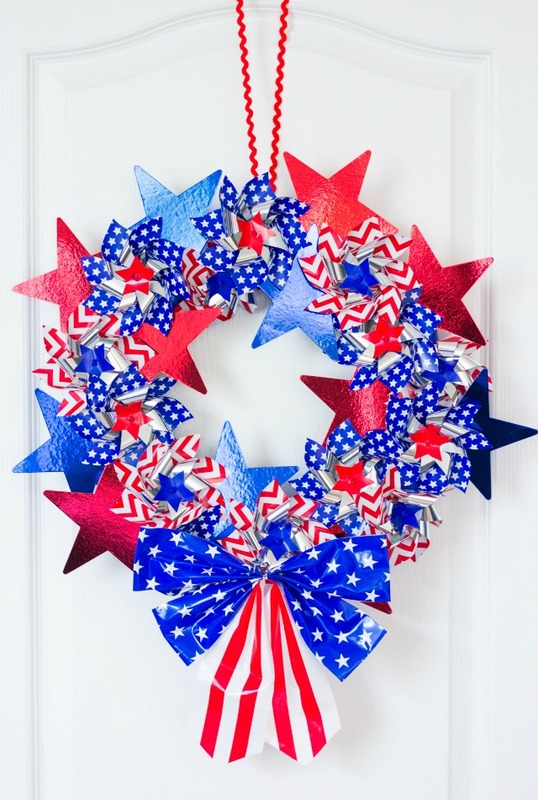 The Fourth of July holiday is at its best when it is spent outdoors with family and friends, don’t you think? 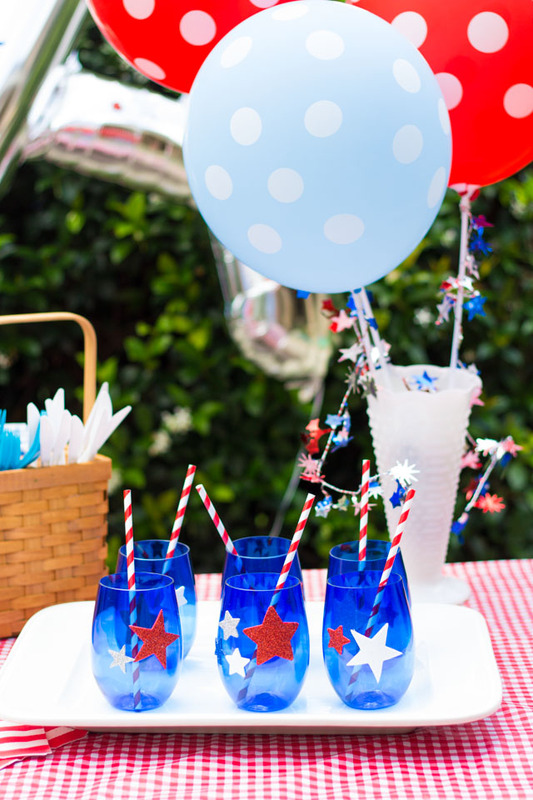 Make this 4th your best yet by hosting a backyard BBQ! 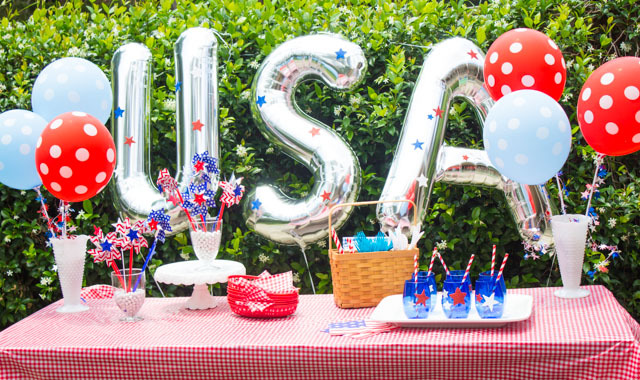 We recently had our neighbor friends over for a patriotic BBQ that I created for Oriental Trading. I wanted to make it festive, but keep the prep simple so I could enjoy it along with our guests. 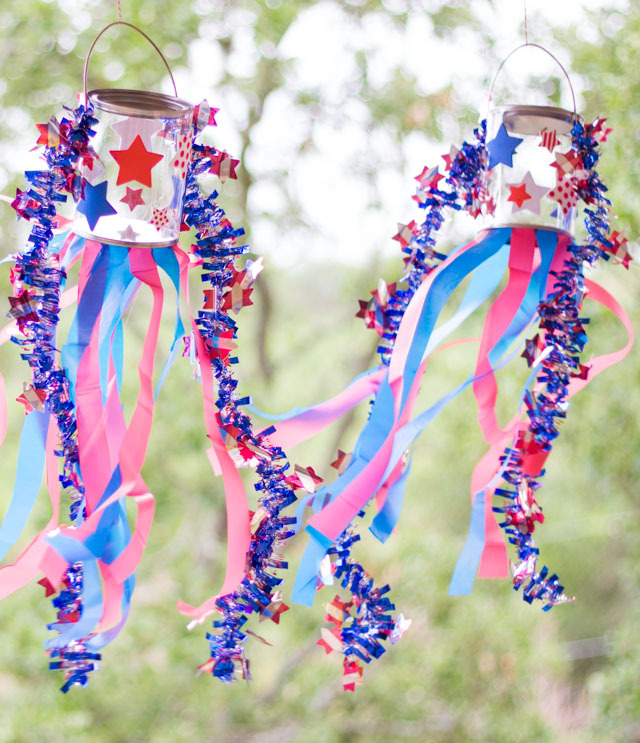 Read on to see how the party came together and 7 ideas for your own 4th of July party! 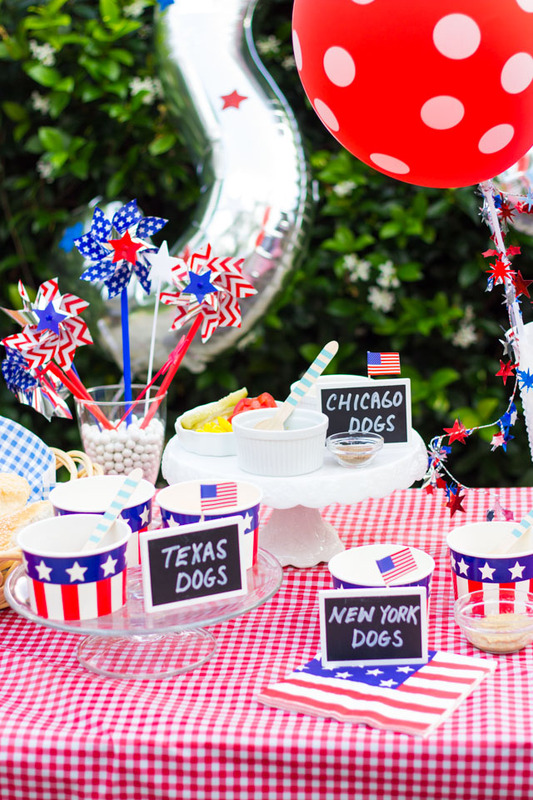 Celebrate hot dog styles from around the USA with this All-American hot dog bar! 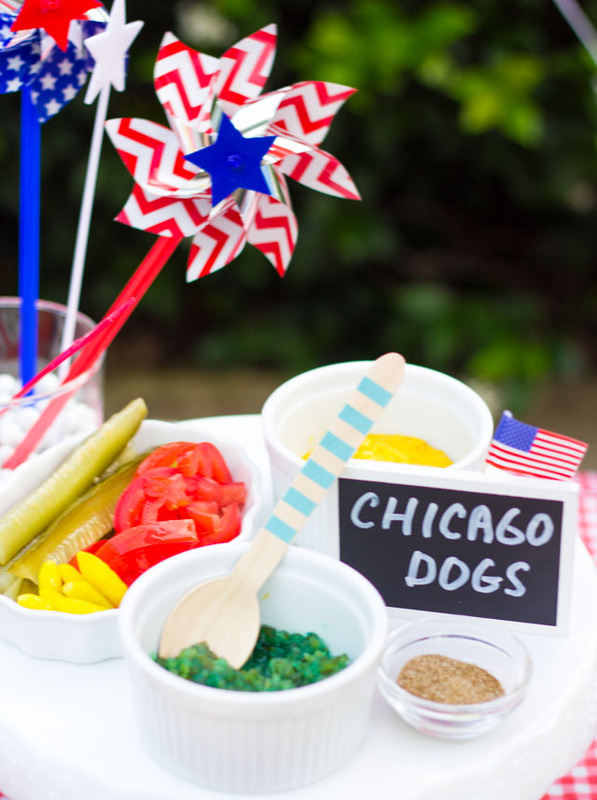 Your guests will have fun choosing from the different toppings to make their dog of choice, and you only have to grill up some hot dogs and sausages. Serving the dogs in diner baskets makes eating easy too! 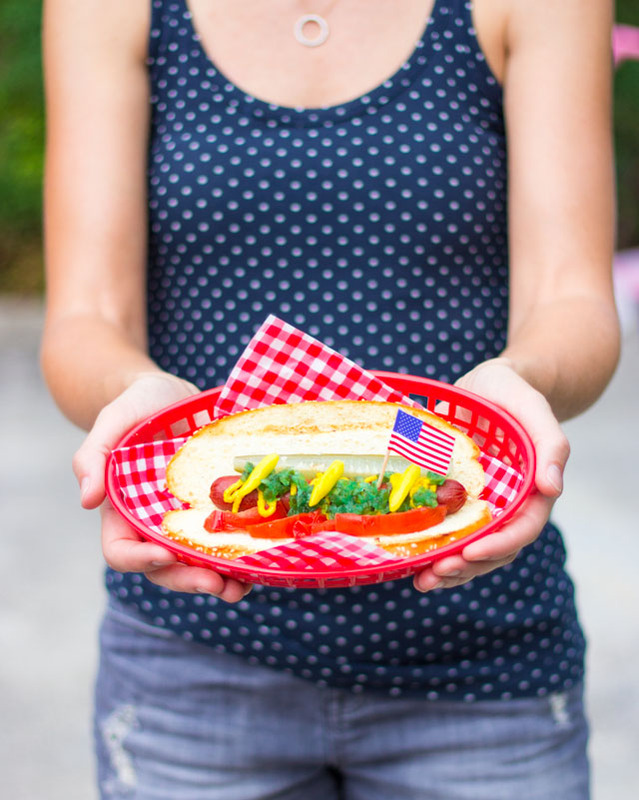 Find the hot dog bar details and list of hot dog toppings from around the country here. 2. Keep Side Dishes Simple With the hot dog bar being the main attraction, you can keep the rest of the food simple. 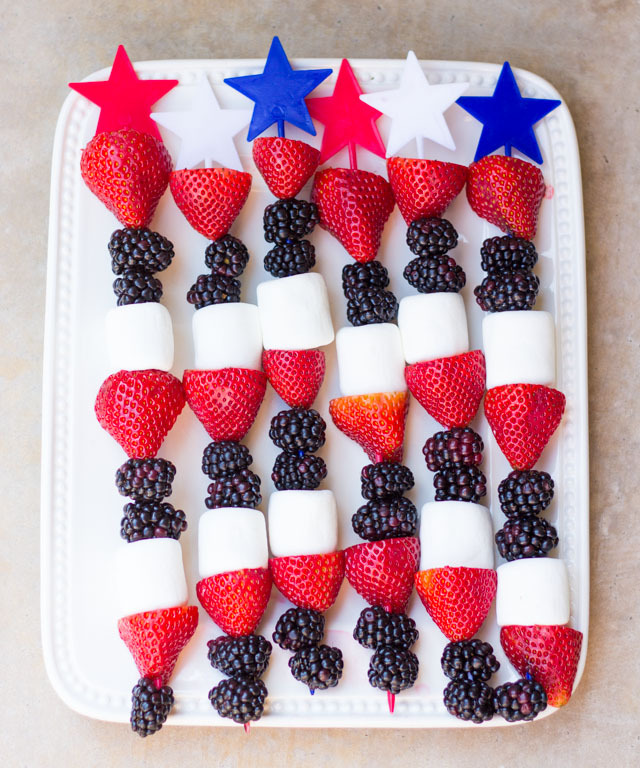 We grilled some corn, set out some chips, and made these patriotic fruit kabobs. The kabobs were a big hit with the kids, especially with the addition of giant marshmallows and the star skewers! For drinks we had lemonade and white wine, served in plastic tumblers that I decorated with star stickers. 3. 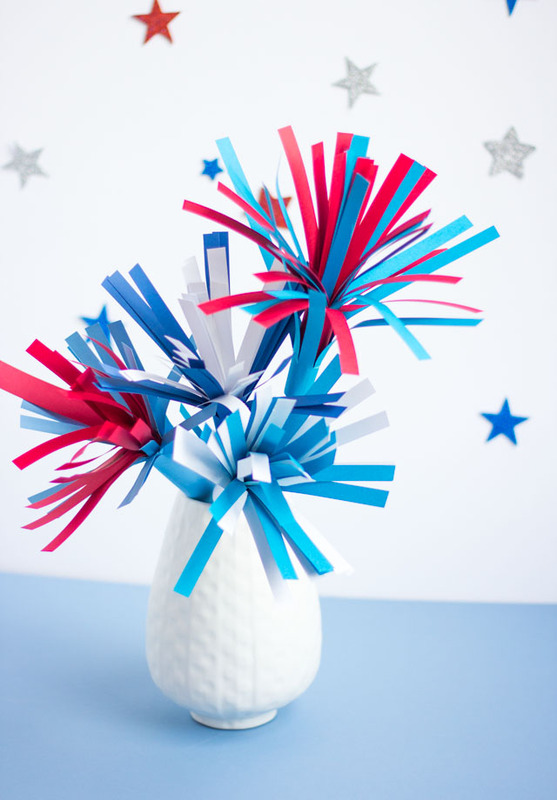 Make an Easy Patriotic Centerpiece For a simple last minute centerpiece, stick some patriotic pinwheels in a jar! Find the details to make this centerpiece here. 4. Add Some Balloons! As you know, I’m a huge balloon fan so I always think they make a party better. 🙂 They also make for inexpensive decor. 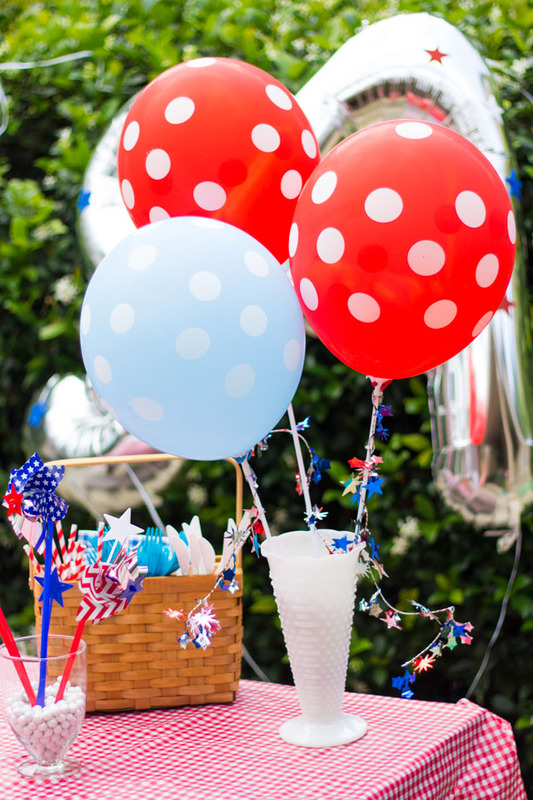 I tied large mylar USA balloons to our bushes for the main party backdrop and added some polka-dot balloons on balloon sticks for table decor. Just know that balloons work best with little to no wind! 5. Provide a Chance for Guests to Cool Off Don’t have a pool in your backyard? 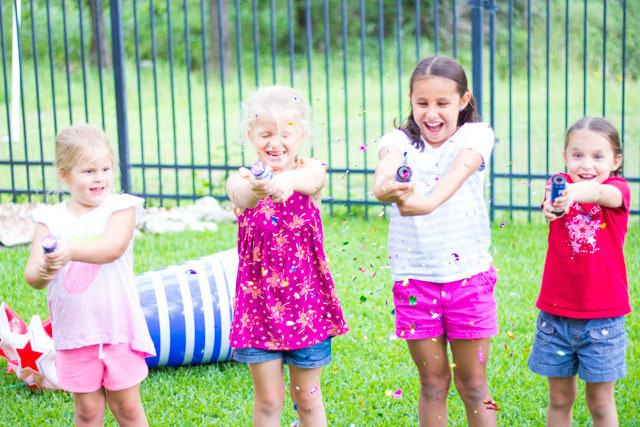 Then just pull out the sprinkler for some old-fashioned fun. 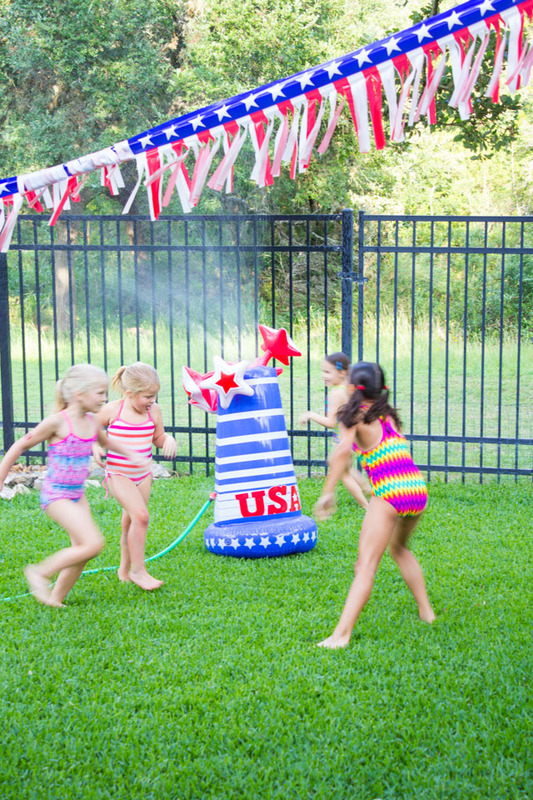 This inflatable USA sprinkler was a hit with the kids. 6. 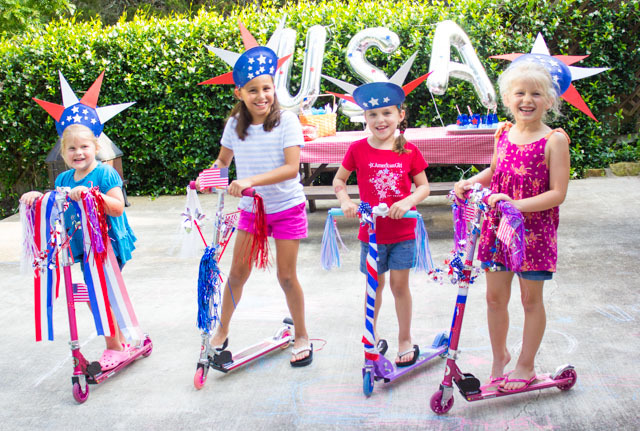 Have a Bike and Scooter Parade We asked our neighbors to bring their scooters so we could decorate them for a little patriotic parade. This was the highlight of the party for the kids! Find out all the details here. 7. End the Party with a Bang! 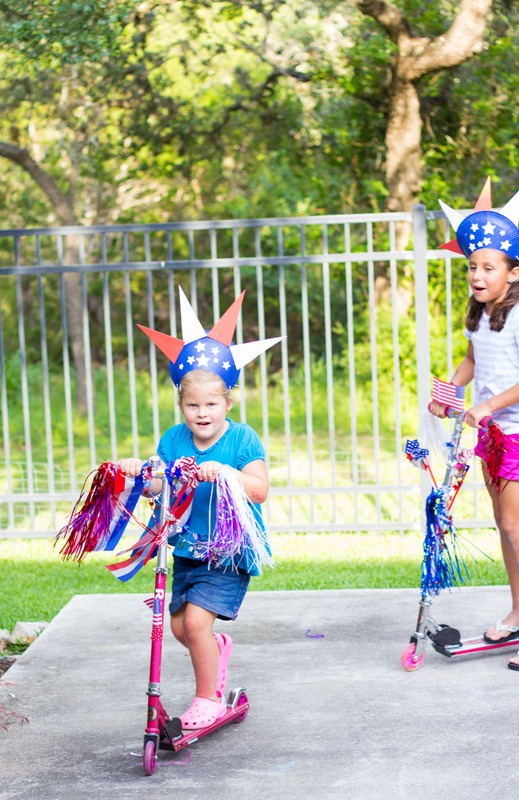 Not crazy about kids setting off fireworks? 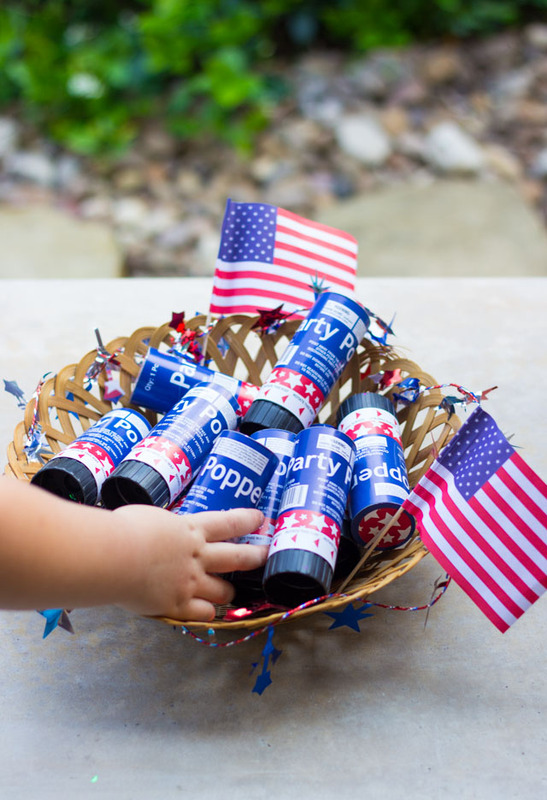 Have them do these patriotic confetti poppers instead! 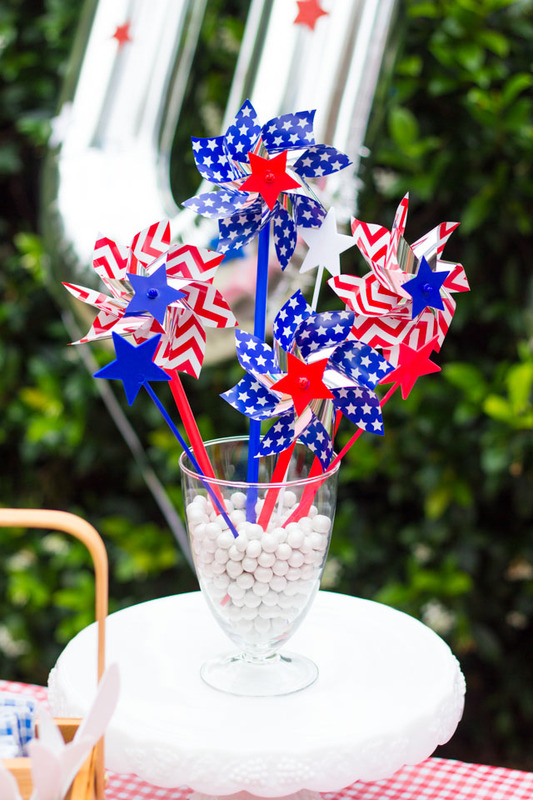 Head to Oriental Trading’s blog for all the details of our 4th of July BBQ including the All-American hot dog bar, pinwheel centerpieces, and patriotic scooter parade!